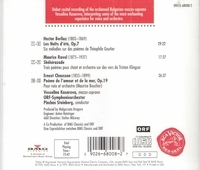 “Vesselina Kasarova's repertoire ranges from Donizetti to Wagner. Critics rave over her voice and her character depictions are the gold standard for young singers aspiring to opera stardom. Her singing appears effortless, burnished and warm in the lower registers and as clearly textured and free-flowing as clover honey up top – a voice New York Times critic Anthony Tommasini described in 1999 as ‘unforgettable and deeply affecting’. Her dramatic skills are superb, letting her master even pathos-ridden roles without being maudlin. She owns the stage – and seems to do so naturally.